PROCESS SERVERS - PROCESS SERVING GOING THE EXTRA MILE! Tired of looking for that professional company to serve your important legal documents? Need to do a court search, court filing, court issuing or a skip trace? Tired of feeling like just another number? Tri-City Process Servers will treat you like family. We understand well-run business like yours and for all your process serving needs we'll have them done in a professional and timely fashion. 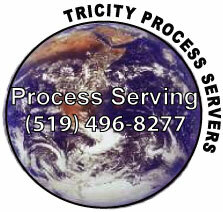 Tri-City Process Servers will ensure that your process serving needs receive the attention it deserves. Our head office is conveniently located 5 minutes from Kitchener-Waterloo. Big or Small, Tri-City's Servers can do them all. Sites of Interest: Process serving networks. Process: A form of proceeding taken in a court of competent jurisdiction for the purpose of giving compulsory effect to its jurisdiction. Service: The act of personal delivery of an originating document or other originating process on an individual, company or entity, usually proven by way of an Affidavit of Service. General: Documents to be served on any person, company or entity for whatever reason, from a Court, or Solicitor require legal proof of delivery Affidavits of Service in Ontario). These documents are generally part of a legal or judiciary action and the method of service (delivery, service of process, process service) of them is strictly covered by a set of rules laid down by the Court Tribunal in which the action is being taken. Personal service (delivery) is often used as the only option available in order to provide proof that the party personally received is in personal receipt of them. Process Server: Person over the age of eighteen year old acting as an agent for a lawyer, individual or entity and employed to deliver a process. Tri City Process Servers - "WE ARE BIG ENOUGH TO HELP AND SMALL ENOUGH TO CARE!"